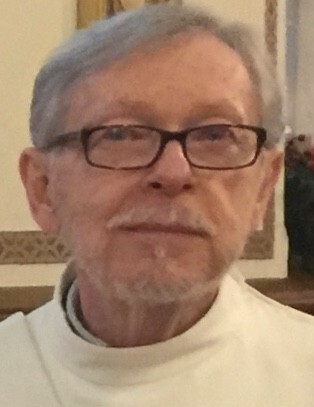 HUDSON—George A. Bourbeau, age 71, of Hudson passed away unexpectedly at his home on August 16, 2018. He was born in Manchester, NH on May 14, 1947, a son of the late George and Yvette (Sills) Bourbeau. George was educated in the Nashua school system and graduated in 1965. He worked as a hair stylist before beginning his studies at Fordham University, where he earned his Bachelor of Arts Degree in Theology. He later continued his studies and was ordained as a Deacon in the Catholic Church. George was an eclectic spirit; he loved everything from gardening and the outdoors, to acting and art. He was a capable handyman and enjoyed building furniture or sets for the Actor Singers of Nashua. His creativity knew no bounds, and he was especially proud of his ability to bring his unique eye for design to the churches he served during holiday seasons. Above all his accomplishments though, George was a friendly, genuine, loving man. He had an innate ability to make every person feel as though they were the only one in the room. His outgoing, and charismatic nature will be deeply missed. George is survived by his two sisters, Carol Ann Rioux of Nashua and Edith Gault and her husband Ernest of Gilford; his nieces Celeste Flores and her husband Juan Carlos of Beverley Hills, MI and Bridget Beane and her husband Jason of Concord; his nephews, Philip Rioux and his wife Chandra of Brentwood, Daniel Rioux and his wife Jen of Hamilton, GA, and Matthew Gault and his wife Heather of Gilmanton, as well as several great-nieces and nephews. He is predeceased by his brother-in-law Robert Rioux. BOURBEAU—Friends and family may call upon the ANCTIL-ROCHETTE & SON FUNERAL HOME, 21 Kinsley St., Nashua, on Monday, August 20th from 5-8 p.m. A Funeral Service will be held at St. John XXIII/Infant Jesus Church, 121 Allds Street, Nashua on Tuesday, August 21st at 10 a.m. At the request of the family, burial will take place at a later date. As an expression of sympathy, donations may be made in George’s honor to Saint Jude Children’s Hospital, 262 Danny Thomas Pl, Memphis, TN 38105.